Our circular cake dummies in polystyrene offers a wide range of cake dummy, ideal for pastry shops or pastry shop retailers. we will be happy to meet your every need. A set of 54 pieces of circular cake dummies made of polystyrene is one of the basic models for the most common cake for a pastry chef. Although the circular shape may seem simplistic, it can provide cake design lovers with the possibility of using the circular polystyrene shelf in the way it considers most appropriate according to the circumstances. In fact, covering the entire circumference of the polystyrene cake dummy with the sugar paste, you can, after having appropriately decorated them, create real sculptures, able to fascinate anyone who observes them. The circular cake dummies in polystyrene are also widely used in cake design courses to allow lovers of the sector, even beginners, to be able to capitalize on their creativity and ability, avoiding waste of cakes. The use of a round raised shelf in polystyrene can have different uses. It can be used by the pastry chef as a raised support of a round cake, to favor a more slender optical effect to the cake, but it can also be used to make cakes on several levels without necessarily preparing an excessive and superfluous number of cakes. In fact, by placing one or more circular cake dummy on each other and decorating each of the circular bases appropriately, it is possible to build a base on which to lay the actual cake, providing the observer with the idea of ​​a monumental cake. The bases for circular cake in polystyrene are also widely used to make a dummy cake, or a fake cake not edible for display or showcase, made by covering and decorating the entire circumference of the base in polystyrene. Why use a set of 54 pieces of round polystyrene cake dummies? 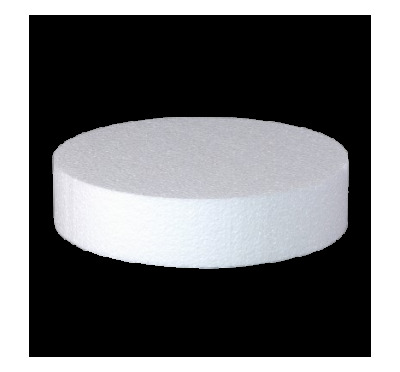 The particularity of a set of 54 pieces of base for round cake in polystyrene is the great savings you can enjoy. If you are a pastry chef or a cake designer, you will need a large number of bases of different sizes. In fact, in the case of a pastry chef, having cake dummy of different sizes means having the possibility of overlapping them to your liking to create a monumental cake. In the case of a cake design retailer, it is always advisable to offer its customers a wide choice of measures. By purchasing a set of 54 pieces you will realize that the savings are considerable compared to the purchase of individual pieces. The set of 54 pieces of polystyrene circular cake dummies, is made with a highly ecological and absolutely non-toxic material, therefore the polystyrene of the circular cake base is also suitable for food use. Another key feature of polystyrene is its durability over time, so the base for circular cake in polystyrene is not subject to deterioration, which is why it is perfect for window decorations of confectioners and cake design shops. The set of 54 pieces of circular cake dummies is excellent workmanship. Our company with years of experience in the field of polystyrene processing and sophisticated hot wire machines for precise and accurate cutting, offers a wide choice of heights and diameters. 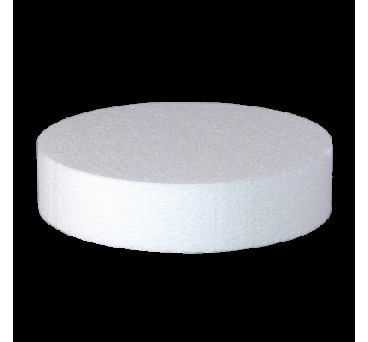 The Deart Polystyrene guarantees the customer quality and reliability, with fast and safe shipments.